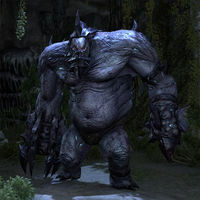 The First Flesh Colossus is Mannimarco's first flesh colossus creation found in the southeastern corner of Traitor's Vault on Artaeum. Defeating it is required to mark the delve as cleared. This page was last modified on 29 June 2018, at 18:10.